When one does so, the color of the metal comes from the diffuse color swatch. However, most people stop there, and get a very dull looking material, and wonder "what wen't wrong?". Just kidding. Anyway, just turning on the "metal" mode doesn't make it look magically like metal. It looks more metal-ish but there is one more thing to do, take care of the BRDF curve. When metal mode is on, the reflectivity (and the BRDF curve) drives the balance between traditional "diffuse" shading and reflective "metallic" shading. So if your reflectivity is zero, or you are at an angle where the BRDF curve is very low, you will be seeing mostly plain old diffuse shading, i.e. not very "metal" looking. 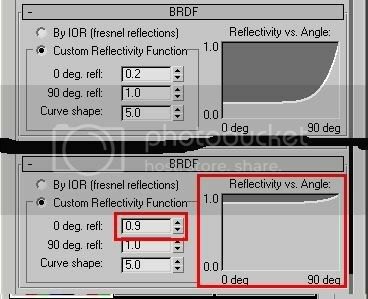 So what needs to be done is to pump up the Reflectivity value (probably to 1.0), and modify the BRDF curve to contain more reflectivity. This works pretty nicely, and most metals can be done this way. But still, it may look a tad "off" in how the reflectivity depends on angle. Well, then we try the fresnel mode. "What" I hear you yell, "Fresnel" is for dielectrics... transparent stuff... like water, glass and such. It is based on the Index Of Refraction. Metals aren't transparent, they can't refract stuff! O'le Zap's gone completely bonkers now! Well... actually... no. Metals are indeed not refractive, and are indeed not dielectrics (meaning, electrical insulators). They are Conductors, and for some baroque reason these are also considered to have an "Index of Refraction". Now, don't ask me how on earth someone came up with the idea of refractive metals or how this is actually calculated... I didn't write the laws of Physics (I just abuse them) so just trust me it's there.... and these values are high. Not your average "1.3" ish like for water, but values like "25" or "50". The above is a gold material under Sun&Sky lighting. It looks "ok", but not great.. why is that? Well, our visual perception of metals come largely from the reflections. While a totally empty sky is "ok" as reflection, it's not more than just "ok"... it looks dull. (But a photo of metal in a completely cloudless desert would look about as dull). Hope this helps in the quest for More Metallic Metals. Hi Zap, this is a great trick. Maybe you could have add that using a mip_rayswitch_advanced node to use both physical sky for final gather and a hdri environment texture for all other ray would have been interesting. connections are simple. Create mip_raysitch_advance, connect the physical_sky into the finalGather attribute of the rayswitch shader, create a spherical lookup node, attach a hdri texture in this envir node...then connect the envir shader into the default attribute of the raysitch node. connect the rayswitch in the camera environment attribute. works like charm. Lighting and FG is performed by the physical sky and all the reflection, refraction, etc are using the hdri. I love the production shaders! I never thought putting such a big value on IOR, I was always trying with values up to 2-3 hehe. 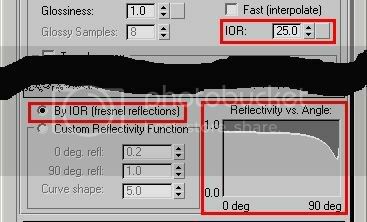 Does anyone know where you could find an accurate IOR list for those "non refractive" materials lol it sounds so wierd, but looks really great. Hey Zap, can you talk about tuning the shaders along with the mia for performance considerations. 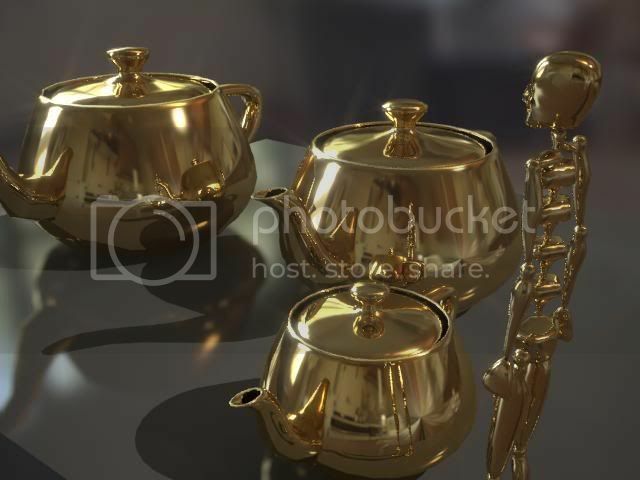 Like the environment blur node and the reflection settings on the mia materials (interpolation)? And maybe some other tricks for rayswitch shaders that aren't as obvious? I love the range of features I can use but sometimes I think I'm making the shader work harder than I need. Great work on the shaders AND the documentation. I LOVE the usability of the documents. David; ask and Ye Shall Receive, see my newest post on mia_envblur. ya would really love to see the maya version , as im still a beginner and would really like to try these out in maya. Thanks Zap! According to the most excellent book 'Physically Based Rendering', the reason conductors have an IOR is that when light energy hits the dead-on, some of that energy is converted to heat. At glancing angles, it reflects more off the surface, making a similar, though not as strong effect as light passing through/bouncing off due to IOR in dielectrics. 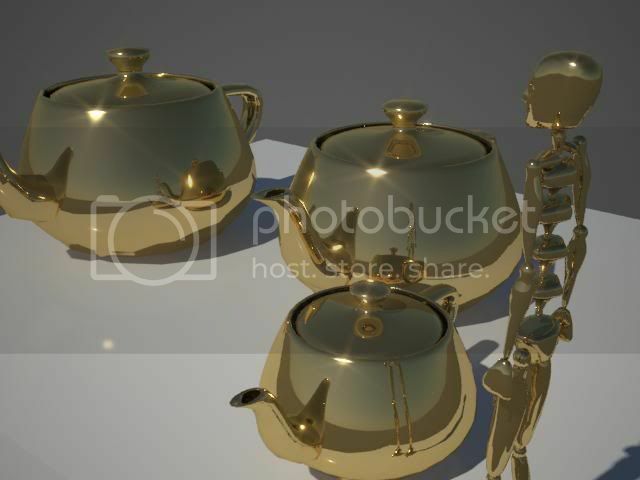 There is a list of IOR's at http://vray.info/topics/t0077.asp but none of them go really high.. I cant even set it above 4 with finalrender's arch materials..
Im trying to create a discplacement map on a mia material but I couldn't get it to work. With a blinn or lambert it works just fine, but mia material doesn't seem to have a displacement node. Thanx for the great tips btw. what a cool stuff. I appreciate your effort for the mental ray freeks. good stuff in your blog. I am very much impressed. I am also a mental ray lover. maya 2008 has mental ray mia_materialx and it can give multi pass output (according to documentation) but when i am trying to do a multipass render with that i am not getting multiple pass output. plz help me. does this goes also for a water shader? for example, in a waterfall exemple, the vertical side will have very weak relections, and will look a bit wierd and dark compared to the horizontal part. I've been following a lot of your tutorials and they are all great and helpful. I would like to ask help if you can provide a tutorial on how to make a realistic stainless steel material that can be used for flat surfaces? like, range hoods, refrigerators, table tops. I tried following the example you showed in "Making Better Material with mia_material" but it seems to not work on flat surfaces, just rounded surfaces. Once again, thanks for all the tutorials you create. I was pointed to this post by one of our TDs and this is slightly in-accurate. Natural materials don't much over IOR 2.5. At least not at the reference wavelength. This is a valid trick but you have to use a super high IOR only because your shader is using the fresnel formula for dielectric materials, not the general one where the IOR is a complex number taking into account light absorption. Thanks Zap, I read all that in your accent as a sign of respect! Loves the tips thanks. Hey there, @ kobayashy, i've been trying to do what you said in your post, i'm on maya 2014, i can't seem to make it happen! Would you mind giving some insight ? Or a simple scen withe right connections? 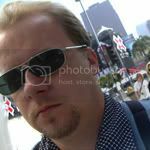 This blog exists as a repository of mental ray tips and as a collection of answers to frequent questions. Maya: No Alpha channel on mia_material(_x)? (c) 2013 Zap Andersson. Awesome Inc. theme. Theme images by rajareddychadive. Powered by Blogger.